A desk is a charming interaction with the past. Often, their secret compartments show whimsy, while the interiors can display exceptional craftsmanship. 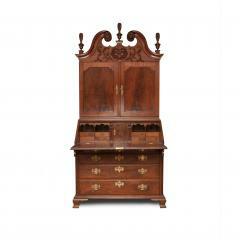 A staple in any collection, a desk offers a workplace of elegance and a statement in any room. If there is a desk you are looking for and do not see, please call or email, we may not have cataloged it yet." 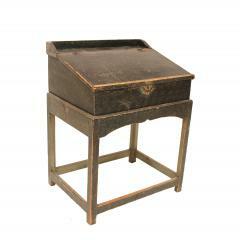 A pine desk on frame with plain interior, brass hinges, straight H stretchers and turned legs terminating in ball feet. A pine desk on frame with original blue grained paint and iron butterfly hinges. It has a lift lid with four interior compartments, box stretchers and straight legs. An exceptional example of a miniature piece of furniture. 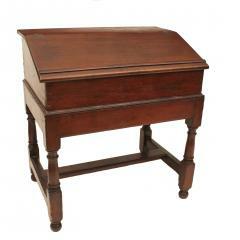 Bearing all the desirable features of a Chippendale slant front deak, this desk has a four drawer arrangement, fluted quarter columns and Chippendale feet. There is a nice interior with a secret drawer. 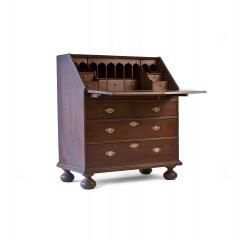 Beautiful and rare walnut slant-front desk with step-up interior, two-over-two drawer arrangement, molded base and turned ball feet. 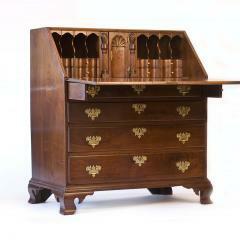 It has a very desirable interior with ten pigeonholes, seven drawers and a well. The lid has a book rack. The case has double-arch moldings and the brasses are engraved. 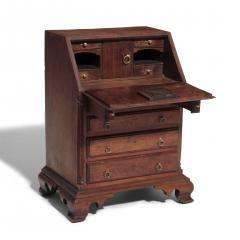 Desk with bold serpentine interior, document drawers with turnings and flames, and block-and-shell prospect door with carved tulip. Case with four graduated drawers and ogee feet.